Add 1 ½ tsp. instant espresso powder to make the chocolate flavor just a little more intense. You can’t taste the coffee at all but it makes the chocolate, well, more chocolaty. This addition of a bit of extra dry ingredient didn’t seem to affect the overall ratio of dry to wet ingredients. Add 1 tsp. vanilla. This is absolutely my grandmother’s hand at work. I just can’t make a baked good without vanilla. Much like the espresso I think it enhances the other flavors in the biscotti rather than standing out as its own flavor. Rough chop the chocolate chips. Kristin mentioned her chips were huge and mine were too. I thought it would b easier to cut the biscotti later if the chocolate pieces were a little smaller. Give the almonds a quick spin in my mini food processor. Almond slivers can be long so, as with the chips, I thought more smaller pieces might make cutter easier in the long run. This also led to good distribution of almonds throughout the biscotti. Cut the biscotti on the diagonal. This is purely for presentation’s sake, but I think it makes for a pretty cookie. Place the biscotti on their bottoms instead of on a cut side for the second baking. I learned this technique in a cooking class a couple of years ago. The chef said it promotes even baking the second time around. I’ve seen all sorts of variations on how you cook the biscotti the second time around so I think this is ultimately a personal preference. Cook the biscotti for only 5 minutes on the second baking. I like my biscotti a little softer than most, so I limited my second cook time to 5 minutes but left the biscotti on the hot pan on the counter for 5 minutes before moving to a cooling rack. Even if you like your biscotti extra-crispy, keep an eye on them during the second baking; the almonds can burn if the biscotti are in the oven too long. I’ll be sharing these with my co-workers to jump-start their Monday morning. 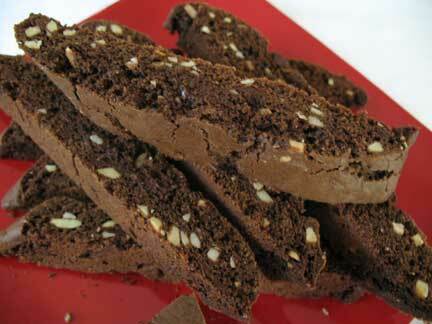 With my modifications, the biscotti are 3 points per piece. That’s not bad for a nice afternoon treat for the sweet tooth. Keep in mind that I make my biscotti fairly long and thick so I only got 26 out of this whole recipe. To create 2 point biscotti cut the logs into 16 pieces each for a total of 32.